While service was awesome, the rest of the cruise experience was just ok. entertainment geared to over 70 pbs watchers, one caribbean island is much like all the others, transfer & arrival at the airport was bring your scope patches. small ships dont have the stability as the big ships abysmal. small ship experience with other passengers was fabulous. 8 uninterrupted days crossing the Atlantic is magic. Weather was bad, and the seas were not smooth going to Bermuda and leaving Bermuda. Tours were cancelled due to lack of participation. For a "chef theme" cruise and 3 special meals: under whelming. Cruise port shops were closed in some ports due to national holidays. Personnel were great, cabin good and the people on board were fun. Great trip I had with my wife , all crew on board were very friendly and serviceable. The ship was great and food was also excellent. 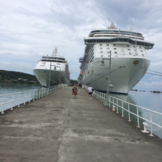 I have been on 5 other cruise lines including other "luxury" lines like Crystal and Regent. Never have I had food this good or been treated so well. The crew did everything they could to be sure that your every desire was met. The itinerary was terrific. we got to explore some of the most beautiful scenery in the world. If you want to live in the lap of luxury for a week, try this cruise. Everything exceeded our expectations food (great espresso and capuccino), cocktails, champagne, service, crew, size of ship, great bed and pillows, walk-in closet, balcony and ambiance. Loved the idea of delivering the paper in Spanish and English. During our 25th Anniversary Celebration our butler Anu got us in for dinner to Le Champagne and arranged for a cake with a candle and written in chocolate Happy Anniversary but when we got back to our cabin he put candle lights and rose petals all over the room and the bed covers plus every single morning he make sure our room service breakfast was delivered correctly and right on time. I believe Silversea could improve on the room internet because it was way too slow. We had a blast. The Silver Whisper is so easy to naviagte around. The fact it is a small luxury ship you are not far from anything. From the wet,cool face towels provided to you at the pool, to the service anywhere on the ship, to the stocked bar our stunning suite and the fabulous food we were sp impressed. Our butler, Ryan, was amazing as well as our suite maid Army. Could have stayed another week and not thought twice. Never turned on the TV or read the daily newspaper provided. Can't wait to cruise again on Silver Sea! Our whole experience was wonderful\, our Butler was THE BEST. This was our honeymoon cruise and we would do it all over again just the same. Very beautiful ship\, wonderful staff\, great food. loved the entertainment. 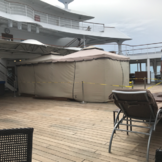 It was my third time on a cruise and my wife's first and it didn't quite meet our expectation. My last luxury cruise was Crystal 10 years ago and the experience was better. The food and all-inclusive drinks selection is great with mediocre desserts but the dining experience was satisfying. Le Champagne was the best restaurant i had on any ship and it's comparable to dining on land. Overall service was only average and the butler was not too attentive and reachable as i expected though he tried to make our honeymoon trip special with two surprises throughout the journey. The excursions were bad and strictly catered to a much older crowd and they discouraged us (in our 30s) from doing stuff on our own so we were restricted to the excursion that they offered. I don't understand why NO FOOD except room service was offered between 4-7pm at any outlets except canapes. I am used to grabbing a bite and snacks after the excursions and were had to be glued to the room if we wanted anything to eat before dinner. The stateroom was nice\, clean\, and spacious with a slightly small balcony but it was good enough. On clam sea\, the ship is extremely smooth and quiet and almost no vibration can be felt but on open sea the ship can sometimes shake quite vigorously and the fittings in the stateroom rattle. Shows were enjoyable but very limited to singing and dancing with not much variety. The gym feels crammed and it closes at 8pm which does not allow any night gym for younger crowd. I liked the idea of an all-inclusive cruise but might need to try a slightly bigger ship next time with Silversea or another cruise line altogether. We felt the food was good and the dining service good. Many times we would call the butler with no resonse. the condition of the cabin was so so. 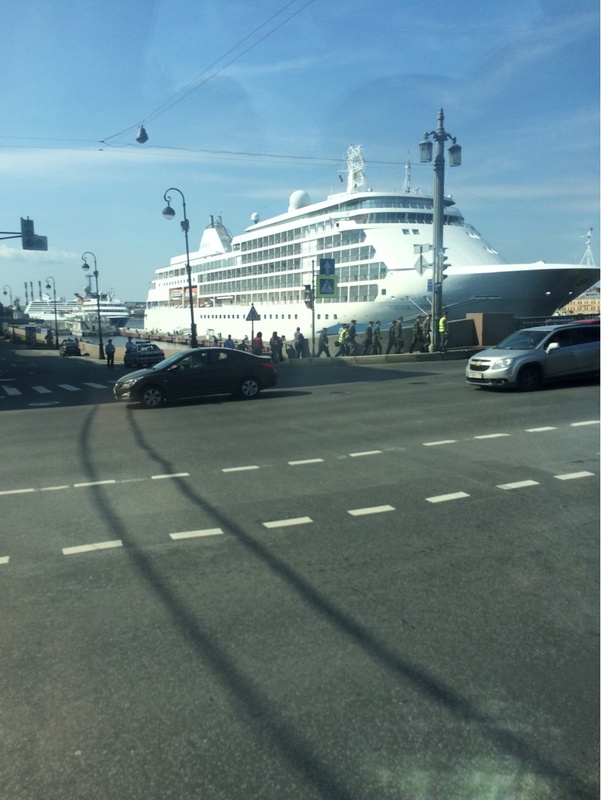 The selection of cities visited on the trip and timing was excellent\, although personally would have preferred the cruise had originated in Oslo Norway and had one less day in St. Petersburg. The Silverseas seemed more like silver hairs\, so had to adjust my expectations for experience with the vast majority of passengers who seemed over 65. If you choose to follow Silver Whisper you will receive weekly email updates with the latest reviews, tips, and photos from Cruiseline.com members about Silver Whisper.